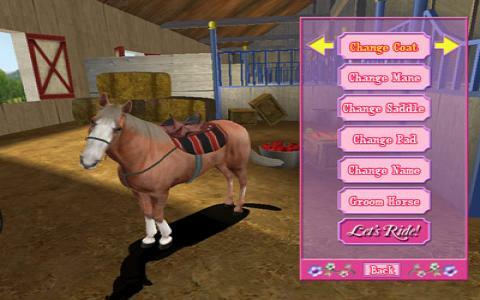 Barbie Adventure Riding Club is a 2003 adventure game for all the girls that have grown with their favourite doll and fashion icon, Barbie! This beauty goddess will take care of and ride four different horses (a gray, white, paint, and palomino, these being the breeds). So, girls around the world, take part of the fantasy adventure and race, discover and learn with Barbie! This game is great for those that want to play something educational and nonviolent. The controls while riding the horse imply simplistic actions, like making it jump, steering, and adjusting the speed. I had an entertaining time with the interesting and challenging puzzles, races and quests, and attention: not dull or childish at all! I say this because at a first glance, Barbie Adventure Riding Club seems a game for kids and little girls, due to the presence of this popular Doll, but things are different, and not you might expect concerning it. Even the adults will take pleasure into playing it in their free time. The locations are exotic and wonderful, and the sound effects are fairly decent. The horseback riding seemed quite realistic and the sensation is well recreated, this being another good thing about the game, and an extra reason to try it!